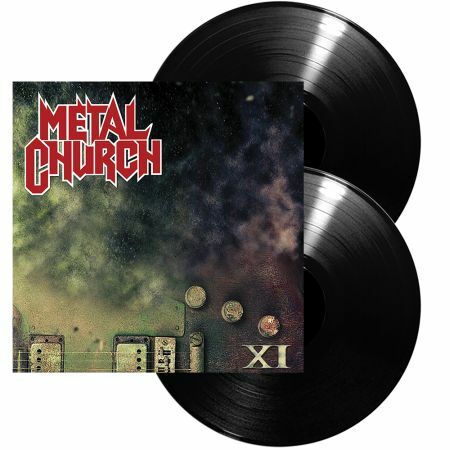 METAL CHURCH - XI VINYL (2LP BLACK) | Online Shop | Wizard LTD. Album: "XI VINYL (2LP BLACK)"
In 2014 founding guitarist Kurdt Vanderhoof convinced Mike to rejoin METAL CHURCH. “Sometimes I still can’t believe it myself, no one would have ever thought Mike would return after his departure almost 2 decades ago,” says guitarist and founding member Kurdt Vanderhoof. “At first I struggled with the decision to come back, but after hearing the riffs that Kurdt was writing, I just couldn’t resist, the music called to me and I wanted to be part of it!” says Mike. Mike Howe originally joined METAL CHURCH in the late 80’s and released three albums with the band: »The Human Factor«, »Blessing In Disguise« and »Hanging in the Balance«. Mike was also the face of group’s popular music videos &apos;Date With Poverty&apos; and &apos;Badlands&apos; that aired during MTV’s heyday. “Mike’s voice sounds the same as it did 2 decades ago when we were writing »The Human Factor” and the band is about as tight as you can possibly get!” says Kurdt. Recorded in the spring & summer of 2015 at Kurdt’s studio in Aberdeen, Washington, and co-produced by Chris “The Wizard” Collier, METAL CHURCH »XI« not only combines all the same musical elements that made the Mike Howe era albums so great, but also adds in a modern approach to the recording process which takes this offering to the next level!